People demand the release of students who had taken refuge at the Jesus of Divine Mercy church amid a barrage of armed attacks, during a protest near the National Autonomous University of Nicaragua, UNAN, in Managua, Nicaragua, Saturday, July 14, 2018. Cardinal Leopoldo Brenes negotiated for the safe transfer of students out of the church and to the Metropolitan cathedral. The students had sought refuge in a local church after police forced them out of UNAN, which had been occupied during two months of protests against the government of President Daniel Ortega. 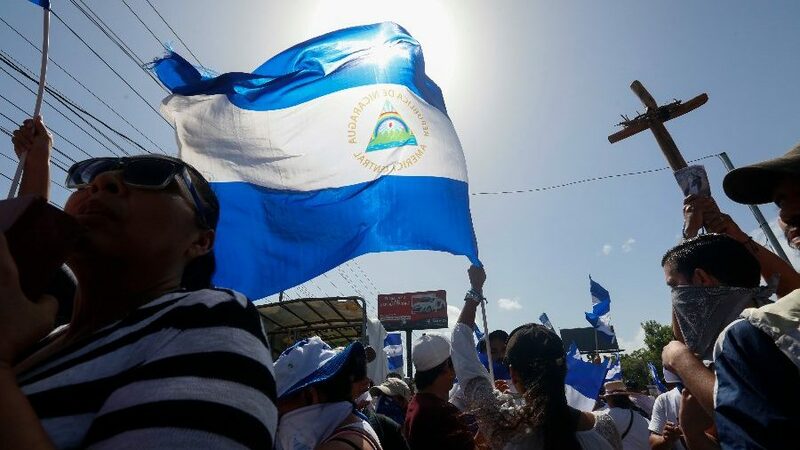 The Catholic Church, which claims the adherence of nearly 60 percent of Nicaraguans, has become a strong defender of the activists — and as a result, an enemy of Ortega. It is mediating the national dialogue process, a forum for members of civil society and the government to pursue peace talks. The Inter-American Commission on Human Rights enacted protective measures for Auxiliary Bishop Silvio Jose Baez Ortega — no relation to Daniel Ortega — owing to the number of death threats he was receiving. Many priests, among them Father Augusto Gutierrez, have been forced into hiding for fear of the threats being carried out.